With the advent of the Congress to the political throne of Punjab, the state government took the initiative of eliminating the issue of unemployment in the state. The Har ghar ek captain Scheme and Berojgari Bhatta Yojana both were implemented, keeping in line with the promise that the party made to the people, as a way of providing jobs to the youngsters. Addressing the issue of unemployment – The main aim of the scheme was to get the support of the people of Punjab by promising them a solution against unemployment. This program promises not only jobs but also provides unemployment allowance. Jobs for one member of each household – To rid the state from the problem of unemployment, the CM has stated that under the Har ghar ek captain Scheme, one deserving member of each household will be given a befitting job. Providing unemployment allowance – providing jobs for the unemployed youth will take time. So, all registered candidate will be provided with Rs. 2500 on a monthly basis as an allowance to battle unemployment. Tenure of allowance – all registered jobless candidates will get the allowance for a maximum span of 36 months or till the time they get a job, whichever comes early. Permission for only one to register – To ensure that maximum people of Punjab get the benefit of the program, it has been announced that only one person from every household must register for the Berozgari Bhatta Card. Number of beneficiaries – As per the reports published by the state government, almost 5 lakh educated and jobless individuals have acquired their unemployment cards by registering under the scheme. Age requirements – Another criterion that the interested candidates need to fulfill is the age specification. Only those jobless candidates will be given the Berojgari Bhatta Card who falls within the age bracket of 18 to 35 years. State-exclusive scheme – Only the permanent residents of the state of Punjab will be able to register under the scheme. Proper documents must be produced to support the claims. 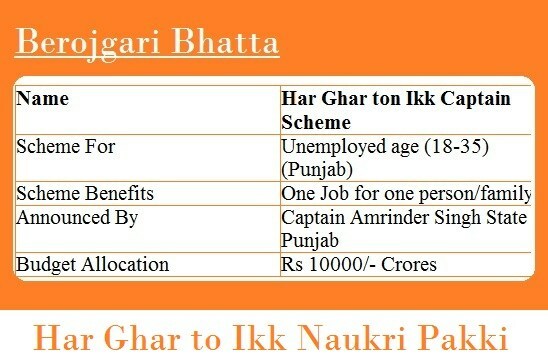 The Captain Job Berojgari Bhatta Card is an important aspect of both the schemes. After registering under the scheme, all the candidates will get the pass with a unique code. The card will be issued by the website and the candidates must download the card, once it has been issued. If the jobless candidate has the pass, they will get the allowance and it is the guarantee that they will get the job as well. How to download the form? Both the registration form and the Captain Job Berojgari Bhatta Card can be acquired from the official website. All interested candidates need to click on the link http://hargharcaptain.com/. As soon as you click on the link, the home page will open and you will get access to the registration form. For acquiring the benefits of the program, all eligible and unemployed candidates will have to click on the authorized link (http://hargharcaptain.com/) once you do this, you will land on the home page. When the home page has opened, the candidate will have to scroll down until he/she gets to the registration form. The application form has many sections, which must be filled in with correct data. The first filed requires the name of the applicant. Then comes the details of the birth date. After that, the name of the district and the Halka must be selected from the drop down menu. After entering the details, the “Submit” button must be clicked. Doing this will generate an OTP. It will be sent to the mobile number that has been mentioned in the form of an SMS. This code must be entered in the marked field. The code will highlight the digital version of the Captain Job Berojgari Bhatta Card. This digital version of the card be downloaded and printed out. There is a unique code on the card it will come in handy later on. Once the registration has been done and the unemployment card has been downloaded, the candidate will get the allowance as soon as the application has been processed. All updates, related to the status of the application can be acquired from the official link of the scheme. The implementation and success of the scheme is very important for the overall development of the state and the deserving youth. For proper empowerment of the unemployment section, the state government has allocated a whopping 10,000 crores as the budget of the scheme.